I ate it and I'm still alive: not poisonous. ...pasta sauce. This sauce was pretty good. I wonder if I can make it twice. My cooking is pretty experimental, and the results are sometimes not so good. Yes, the yellow spots are leaves from the trees. Most of the leaves are still greenish, but some are totally yellow and red already. It's not the cold that turns them yellow, although it can get below freezing at night on a cold day. It's the shortening of the daylight that triggers the change. Sunrise was today at about 5:50 (am) and sunset is about 21 (9pm). Some of the newspapers already have articles for cyclists to remind them to check out the reflectors and lights on the bikes. With mornings and evenings getting darker and a lot of kids and students going to schools by bike, they're a good reminder. Sadly some of the articles cointain factual errors, but it's not a very big deal if the reflectors are wrong color or something like that. When they write articles about yielding rules for cyclists, the errors will cause danger for cyclists and confusion for everyone. Somebody had been digging some pipes with an excavator, stirring the water brown. It's not normally that brown. I'm not sure who found the bike, but it had been in the water for a while but not totally rusted. I stopped and took the photo to prove that the horse poop blog- sorry, I mean cyclingwithoutahelmet :-P is not the only place where you can see bikes fresh from a canal. With the new buildings came a few new bikeways. These are really new routes, riding them will certainly qualify for LGRAB summer games. Recently the local newspaper told the city has decided the new standard for MUPs is 3,5 meters minimum width, to make it easier to clean them from the snow in the winter. The gap between the bikeway and the street is for snow. but bikes a plenty. I tried to count the cars in the parking lot and the bikes parked in the racks, but that is difficult because they keep moving. There was about 50 cars, and 58 bikes. This is a supermarket which has a huge parking lot, and it's located very conveniently for car commuters to do their shopping. On a sunny sunday most of their customers got there on their bikes. Awesome. A detour, while the bikeway seems to be fine behind it? And all cyclists actually following the detour, rather going around the barrier? Now this could be worth a blog post! Well, this explains it. A look from the other end of the blocked bikeway. They've cut the old bikeway and left us with sharp edges and gravel. The new route is an easier and a more comfortable route. Otherwise we'd be likely to ignore the barriers. A week after this photo, they had dug up more of the bikeway, all the way to the other barricade. I decided I'd make a post, or maybe even a series of the street construction project instead. It seemed to me this project was not really as good for the cyclists as it first seemed. Here's a video on youtube so you can see it yourself. Plenty of reaction time for cyclist from the left. But how about cyclists from the right? I certainly hope they're not going to park vans like this to block the view once the construction is finished. Also note the unpaved area in the middle of the street. I guess theyre going to plant trees on it. Sadly, it's also additional hump on the bikeway. A very limited view to the right. Also note how the sign post with yield triangle has also the street name sign on it? Who would put the name sign on a post 20 meters from the intersection? Looks to me somebody dragged the yield sign from the intersection here to cover the bikeway. A look from the right. Can't see the cars until you're almost on the crossing. Was this an improvement over the previous bikeway? Let's list the pros and cons. On the side of the street the bikeway was covered by the yield signs on the sidestreets. Cyclists had priority over cars on the sidestreets and over cars wanting to turn to the sidestreets. By moving the bikeway 20 meters off the intersection, the street-bikeway crossing is a stand-alone crossing on which bikes must yield to traffic. Cyclist on one of the busiest routes must yield to cars going to and coming from the parking lots of the buildings! The old bikeway crossing was pretty smooth, now there is and extra hump in the center of the crossing. Limited visibility, with no speed humps for the cars. Why not build a raised crossing? It's a part of the diagram of the construction site. The intersection I've been complaining about is the black bulls-eye. Guess what? That bulls-eye is a roundabout! It makes many of my worries nought. All my ranting and planning was wasted! A vehicle exiting a roundabout is turning, and must yield to traffic going straight. Cars have to yield to bikes! And the other direction is covered by the yield sign. Cyclists have not lost priority after all. Now, the raised crossing would still make sense. I'll have to see if I can find out if they're going to build it or not. The crossing has asphalt now, and I think they would have to cut it open to install a raised crossing. That would suggest they're not going to build it. On the other hand, they need all sorts of heavy equipment and lots of gravel and cement and stuff when they're building. So it might make sense to do the humps after the buildings are finished. Is it going to be better than before? We'll find out when it's finished. Edit: I got a reply from a city planner, and he said there's no plans for a raised crossing at the moment as it should be fine as it is. 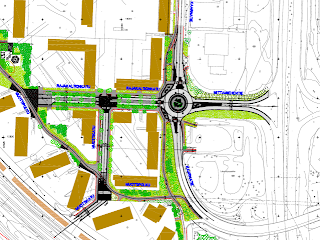 The traffic circle will be built next year if they have the money to do it, and it will improve the intersection experience. Yes, that is really a "no cycling" sign. I was waiting on the traffic lights and I didn't notice it until the light turned green. I crossed the street and took the photo from the other side, thus the angle is bad and the other traffic sign telling cyclists which way to go blocks it. The blue signs guiding cyclists to the right are also rare. It is obvious why it is needed. They're doing repairs on the facade of the building, and the scaffold is over the sidewalk (which is a MUP). One could get through it on a bike, but it's too narrow to pass anyone on a bike. And if someone lost balance on the bike and hit the scaffolding, the whole thing might fall down. There's been at least two cases this year where a scaffolding has collapsed due to wind. Or is it incompetence of the builders who don't know how to build scaffolding? Anyway, It's easier for the cyclists go to go the other way rather than try to squeeze through. What's this "road work" sign doing on a bikeway? Usually they don't put up such signs, as we can see the barriers or ropes around the work pits easily. In this case, there's a long downhill and cyclists might be coming fast, and they're doing some cable digging on the left just behind the corner. So I consider this sign well placed. Zebra lines have been cut to mark bikeway crossing. The cyclists (over 11 years olds) are not allowed on footpaths. So, they're not allowed on zebra crossings either. A cyclist should walk the bike across. A lot of people whined about cyclists breaking the law by cycling on the zebras. 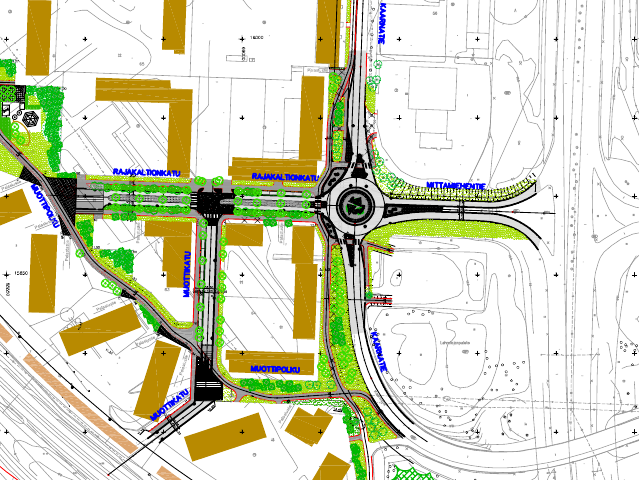 But many of the sidewalks and paths are in fact multi-user paths, and the bikeway continues on the zebra. Cyclists can legally cycle on the zebra crossings for those paths. The problem was the law said they didn't have to paint the bikeway crossings on the street, they could use regular zebra paintings. This made it difficult for other road users to know there was a bikeway crossing too. The law changed recently, and now they have to mark the bikeways, either by lines or by leaving a gap in the zebras. It has no effect on yielding rules for cyclists, it's just a change in the markings to make things more clear. The road painters have until 2020 or something like that to change the markings. Mostly they're going to renew the zebras in the new style when the old markings get too worn out, but I've heard they've sanded off the paint in some places to get the new markings. Yesterday I was downtown, riding on one of the sidewalk MUPs that actually has cycling and walking separated to prevent 'dooring'. There's a row of street lights, bike racks, trees etc, and people are supposed to be on the street side if they're biking and away from the street when walking. Look at the picture, how does this help dooring? The cyclists are next to parked cars, in the door zone. The dooring I'm talking about is cyclists scaring or even hitting pedestrians stepping out of shops' doorways. There's more people stepping in and out of shops than there's people getting in and out of cars, so this arrangement makes sense. The bikelane is two-way, and we have right hand traffic. A cyclist riding close to the cars would very likely be riding towards the camera (unless passing pedestrians like I was), in view of the passengers and driver. So a passenger could easily see the cyclist and not hit him with a door. And if he did, the door would close (and possibly squeeze the passenger), not open more and throw the cyclist into the racks. There was this one woman walking slowly in the bike side, and although she was not the only one, she was walking particularly middle of it to block the whole lane. I decided I would ask her in a friendly manner if she had noticed she was walking in the wrong lane. When I passed her, I asked her in finnish. To my surprise, she asked me in english (a tourist from the UK, likely) for directions to a bar, and I forgot about telling her off when I tried to remember how to find it. Doh! The first leaves are turning yellow, and the sun was already so low it can reach the top of the trees. The sun is setting, and it's only 10pm! The outdoor swimming season is pretty much over, Jaakko has thrown the Cold Stone in the lake on July 25th and the waters are getting colder. Yesterday, I saw a flock of swallows flying and chirping like they do before they start their migration back to south. The temperature was about +17C yesterday during the day (+17-20C is very typical), and a few degrees colder during the night. No wonder a t-shirt and shorts was chilly on my ride home after the sunset. Not quite the same as in the south? This photo was taken near the bikeway I took a few days ago. It's on the left, behind the houses, parallel to this street. In this intersection an L-shaped connector road (coming from left and going forward in the photo) meets a non-through residential street coming from the direction I came. And there's one bikeway coming from right a little behind me, and another is visible on the photo. Although the residential street is non-through for cars, the bikeways are connected to other residential streets further away. You can see the bikeway continuing on the right, but there's another bikeway on the other side of the street. You can spot the MUP sign behind the pole of the yield sign. Both bikeways (MUPs) are bidirectional. That is to make it easier for users to get to their destination. 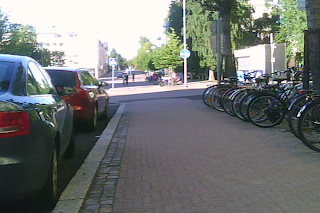 The University is about 1km ahead, there's a kindergarden, primary, secondary and highschool, and library etc in the area. Not to mention a little shopping mall. A lot of young kids and adults on their bikes in the area. I think the bear hunting trip would qualify in the "take a picture of summery thing". Unfortunately, on my return trip it was raining. The thunderstorm was faster than me on the forest paths. So when I got lost and "Explored new bikeways" in "New parts of town" , I was not going to take any photos in the rain. I'm not sure if it would qualify in all all three categories without any photos. So when it was a sunny sunday, I got out and went to pick more berries and take some photos. Even on the way to my secret berry patch, there was a few bikes parked along the side of the bikeways and various recreation paths in the forests. I was certainly not alone with the idea of using a bike to go berry picking. OH NO! Look at all those tracks! This muddy path is supposed to be hard to reach and far from civilisation. It's not even on a map! Not far enough for berry hunting cyclists. And it felt like they picked up almost all the berries, the pickings were slim and there was footprints everywhere. On the way back I decided to cycle on this road instead of on the paths through the forest. It's a typical country road outside towns. It has 100km/h speed limit and no protected cycle facilities at all. Not even a shoulder, so I had to cycle on the lane itself until I got closer to the town and on the bikeways. This is a very scenic path on the banks of the river Oulu. You can see some water behind the railings, and the hydro power plant is further ahead. It's very pretty in the winter too, when there's snow in the trees and lights on the poles. I'm not sure if I posted pictures of it last winter? In the 'junk' post I showed some ugly photos I've taken lately. Here's some prettier ones to even up the balance. I was surprised when I saw a car on the bikeway. I think someone stole it and drove on the bikeway until he crashed. It's on a three bikeway intersection, with tight 90 degree turns that are hard for cyclists too, let alone a speeding car. It's been a few days and the car and the debris was still there. Makes me wonder if anyone has informed the police or is everyone thinking someone else did it. What's even weirder is that the car has five wheels. I didn't take photos from the other direction, so I don't know if it was there before, but today I noticed a fifth wheel next to the car. Did the car thieves take it out of the trunk or did someone bring his own tyre there to get rid of it? That does sound weird, but based on what I've seen that just might be possible. Consider the evidence in the next few photos. Someone carried a can of beer with him in to the woods. Unfortunately he was too tired to carry an empty beer can back home. Instead he threw it into the woods. to the recycling center or scrap yard, he would rather drive on bad forest roads and/or carry the items into the woods. The washing machine was next to a forest road, but I don't think anyone could have driven a car to drop the tyres. He had to carry them there! All that effort and sweating to avoid easy work, it doesn't make sense! On this post the tag 'junk' is spot on.